Meeting was called to order at 8:35 p.m. by Co-Chair Scott Mead. Reorganization Meeting was called to order at 8:05 p.m. by Chair Charles Kuettel. Meeting was adjourned at 8:30 p.m.
Meeting was called to order at 7:30 p.m. by Chair Donald Swanstrom. Clerk’s Report : The minutes of the Board of Supervisors meeting on March 12, 2019, was presented and reviewed. Motion by Swanstrom to approve the minutes, second by Dressen, motion carried, 3-0-0. Kuettel motion to approve the March 2019 Treasurer’s Report and the April 2019 Claims, second by Dressen, motion carried, 3-0-0. Update on the acquisition of land – Swanstrom reported that he was advised by St. Louis County Assessor’s Office that a Resolution for State Deed Application for Tax-Forfeited Land is required for submission along with the application form. The Resolutation will be discussed at the Reorganization Meeting right after the Town Meeting tonight. Reminder: Local Board of Appeal and Equalization meeting on April 18 at 1:00 pm at Pequaywan Firehall – The purpose of this meeting is to determine whether property in the jurisdiction has been properly valued and classified by the assessor. Appointment of township Chair and Vice-Chair – Swanstrom nominated Kuettel as the New Chair, Kuettel accepted. A Resolution was passed for the appointment of Swanstrom as the Vice-Chair. Motion by Swanstrom, second by Dressen, motion carried, 3-0-0. Oath of office for new supervisor – Wallace reported that Dressen was sworn-in before the April 1st deadline after completing all the required documentation as the new elected supervisor. New supervisor access to Town website – Wallace reported that Lee Kaplan had given access to Dressen to have access to the Town website. Wallace updated the list of supervisors, replacing Scott Mead with Dressen on the town website. Changes on co-signers of bank accounts – Barnes specified that as soon as the minutes of the April meeting had been put on the town website, he can start processing the transfer of signatory with the Credit Union from the departing supervisor Scott Mead to the new supervisor Douglas Dressen. New look of the meeting minutes – Wallace reported that at the recent training she attended, it was advised to have a sign-in sheet for the attendees which will be effective this month. Another change is that there will be three digits preceding a vote, the first number represent yay vote, second number nay vote, and third number abstain. Recording Secretary to take minutes for May Board Meeting – Wallace requested for Recording Secretary to take and type up the minutes for the month of May, if need arises, due to a possible unavailability of the clerk. The request was approved. Meeting adjourn at 8:00 p.m.
Meeting was called to order at 7:37 p.m. by Vice-Chair Scott Mead. Number of resident/s present: 3, number of non-resident present: 1. Clerk’s Report: The minutes of the Board of Supervisors meeting on January 8, 2019, was presented and reviewed. Motion by Kuettel to approve the minutes, second by Mead, motion carried unanimously. Mead motion to approve the January Treasurer’s Report and February Claims, second by Kuettel, motion carried unanimously. Update on land acquisition- Mead reiterated that we may be able to get the 3.5 acres of land managed by the state for a small fee. The supervisors had met with folks from the county and they were very helpful. Town Election and Absentee Voting: Wallace reported that Town Election is scheduled on March 12, 2019 from 5:00 p.m. to 8:00 p.m. at the Pequaywan Firehall. Absentee Voting runs from February 8-March 11. Contact the clerk if you have any questions (peqclerk@gmail.com). Wallace added that no one filed an Affidavit of Candidacy therefore, residents can write-in their candidate. Special Meetings: (1) Board of Audit and Budget Meeting – February 8, 2019, after the Town Meeting; (2) Board of Canvass Meeting – March 12; and (3) Reorganizational Meeting – April 9 after the town meeting. Board of Audit/Budget Meetings: In the future, Barnes suggested that the board schedule a Budget Meeting before the Board of Audit meeting so that the budget for each account codes can be determined for CTAS purposes and Audit reports. Otherwise, the beginning balances will all show zero. Purchasing Microsoft Office software vs. renewing license when license expires in September 2019: Barnes explained that it is cheaper for the town to purchase the software when the current license expires since the license has an annual renewal of $108.00 while the software only costs under $200.00 per laptop. Motion to approve by Kuettel to purchase software for the two laptops, second by Mead, motion carried unanimously. Future road repairs for West Branch Road: Some residents reported that there are areas having wash-out problems of the newly repaired road. Mead said the supervisors checked on it and decided that the road may need re-enforcement especially in swampy areas where it might be a possible more wash-out. Mead added that KTM needs to be notified. Public Comment: A resident is interested for information on where Pequaywan Fire Department is planning to spend the $1500.00 increase that they are requesting from the township. Mead motion to adjourn at 8:30 p.m., second by Kuettel, motion carried unanimously. Number of resident/s present: 1, number of non-resident present: 2. Clerk’s Report: The minutes of the Board of Supervisors meeting on December 12, 2018, was presented and reviewed. Motioned by Kuettel to approve the minutes and seconded by Mead. Motion carried unanimously. Swanstrom motion to approve the December Treasurer’s Report, second by Kuettel, motion carried unanimously. Barnes reported that an employee requested a state tax deduction which had been deducted from the salary but not yet paid to the State as the township had not set-up a Tax ID # with the State. A check in the amount of $150.00 will be issued to the State of Minnesota this month as soon as a correspondence with the Tax ID # is received by the clerk. Kuettel motion to approve the January Claims, second by Mead, motion carried unanimously. Treasurer Barnes explained that with the CDs being considered as investment as had been adjusted in CTAS due to the requirement by the State Auditor’s office, it is now not showing in the beginning and ending balance column of the Cash Control Statement report but is showing in the Total Per Bank Statement of the report. Update on land acquisition: Swanstrom reported that he had acquired the application form to have the 3.5 acres adjacent to township property managed by the state be gifted to the township as a tax forfeited land. There were some areas on the form that Swanstrom had a question so he contacted Karen Zeisler of the St. Louis County, Land & Mineral Department, for assistance in completing the form. As soon as it is completed, he will mail out the form. Tree planting: The supervisors along with an expert met at the township land to determine what trees to purchase and where to plant them. They are looking at purchasing White Cedar, Red Pine and Maple. Further testing of the soil can be done to make sure we are planting the right type of tree. Swanstrom motioned for Mead to contact DNR (Department of Natural Resources) and purchase Red Pine and other seeds, seconded by Kuettel, motion carried unanimously. Comprehensive Plan: The county just updated their Comprehensive Plan and if we don’t have our own, what they have will apply to us. If we have our own that is exclusive to the township, we can submit it to the county and if they approve, it will be what we will use. Wallace reported that as of this date, no one from the community has submitted an Affidavit of Candidacy for the open supervisor position. The board reiterated the importance of someone coming forward to serve. If no one submits an Affidavit of Candidacy on or before the deadline date of January 15, their name can be put on as Write-in. Fire Department Update: The Board expressed appreciation for all the work that Pequaywan Fire and Rescue is doing for the community. Fire Chief Dale Brooks reported that there are more calls this year than in the past. The Fire Department is requesting a donation of $15,000.00 from the town levy, a $1,500.00 increase from last year of $13,500.00 which will be further discussed for approval at the March Annual Meeting. Membership to Duluth Association of Townships (DAT): Last year, the town paid the membership fee to DAT but Barnes reported that membership for DAT is not required. He is inquiring if we should stay as a member. The Board agrees that they should attend the meeting and decide at a later time if it is advisable to join this year or next year. If we will join this year, Barnes will issue a check. Approval of Election Judges for March Town Election: Wallace presented a list of certified election judges for Board approval to serve at the March election. Motion by Kuettel to approve the election judges (Lita Wallace, Katherine Sluka and Robert McDonough) as presented, second by Mead. motion carried unanimously. Meeting was called to order at 7:35 p.m. by Chair Donald Swanstrom. Attendance: Town Officers – Chair Donald Swanstrom, Vice-Chair Scott Mead, Supervisor Charles Kuettel, Treasurer Raymond G. Barnes, Clerk Lita Wallace. Number of resident/s present: 2, number of non-resident present: 2. Clerk’s Report: Kuettel motioned to approve November Minutes with corrections, Mead seconded, motion carried. Kuettel motioned to approve November Treasurer’s Report and December Claims, Mead seconded, motion carried. Weed survey update: Deborah Pomroy, Weed Inspector for Pequaywan Township, provided a copy of a report, 2018 Annual Township Report Noxious Weed Control, submitted to St. Louis County. Pomroy reported that she completed inspection of 12 linear miles on both sides of Pequaywan Lake Road. Determine what trees to plant on the township land and how to proceed: Mead reported that Red Pine, White Pine and Jack Pine are the advantageous trees to plant and possibly Tamarack in the low areas. Not recommended are Maple and Hardwood. About 100 trees may be planted per acre. We can also throw seeds (i.e. Oak) in the area. Need to leave open space for future use for a building. 500 trees may be purchased from DNR plus other possible sources.Pomroy mentioned that there was a study that Knapweed poisons the soil after five years of it growing on the same place and plants and trees could get killed. She suggested to purchase seed grass Sunflower Heliopsis, a plant that competes with Knapweed. Supervisors requested Pomroy to meet with them at the site for her professional opinion on what trees to plant and location according to soil condition. Discussion on purchasing tax forfeited land adjacent to township property: The Township can purchase the land for $1,500-$1,700 per acre @ 3.5 acres; or submit a form to have it gifted to the township which will cost around $1,000. Mead motioned to submit an application to obtain ownership of the land using Tax Forfeited Procedures for the state land that borders on the north between the township land and Rossini, land that the county administers. Kuettel seconded, motion carried. Update on reporting of township accounting practices: At the last Treasurer training that Barnes attended, he learned that the State are requiring townships to enter interest income in CTAS as investments. Most treasurers in attendance at the training stated that they have been entering interest income as interest and not investment. Many townships, like we do, use Money Market as an extension of checking account but the State Auditor requires it to be entered as investments. This requirement is effective in 2018 transactions. In addition, Barnes mentioned that to make the switch in CTAS data entries beginning from January 2018 will require a lot of work. Clerk Wallace requested to attend MAT Clerk/Treasurer Training (CTAS reporting, 2019 Board of Audit Meeting, and Annual Meeting ) at St. Michael MN: Mead motioned to approve, Swanstrom seconded, motion carried. March Town Election – one Supervisor position open. Filing dates January 1-15, 2019, contact Clerk Wallace to request a form or print from AFFIDAVIT OF CANDIDACY AND RECEIPT FOR FILING. Clerk’s Report: Kuettel motioned to approve October Minutes, seconded by Mead motion carried. Kuettel motioned to approve October Treasurer’s Report, seconded by Mead, motion carried. Swanstrom motioned to approve November Claims, seconded by Kuettle , motion carried. Clerk’s Report on general Election held on November 6: Pequaywan Township Precinct 0875 was open from 7:00 a.m. to 8:00 p.m. It had 128 registered voters with 20 absentee ballots and 86 voting in person, a total of 106 votes. Three judges conducted the election. 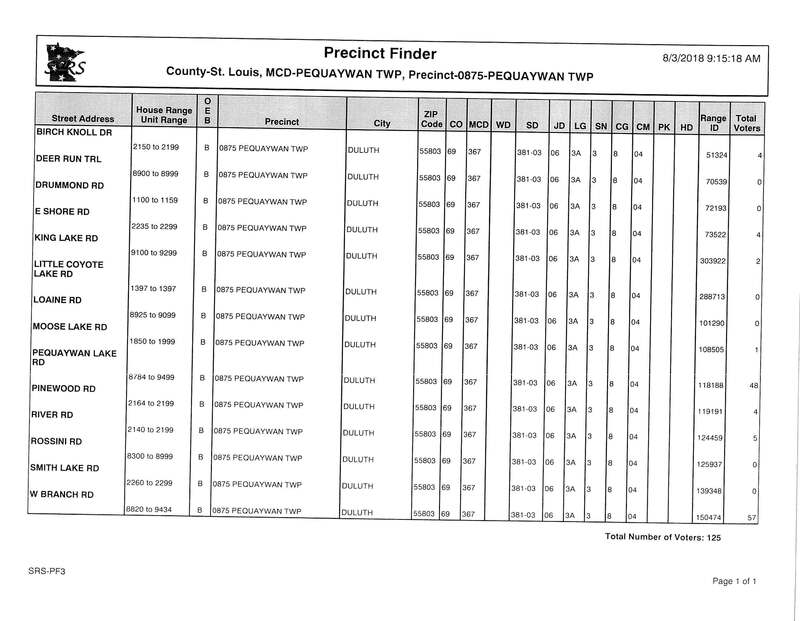 Manual counting was done which lasted until 11:30 p.m. results were relayed to St Louis County. Karen Zeisler, tax-forfeited Land Coordinator, with Saint Louis County was present to discuss options of the township gaining access to township property off Rossini. There is approximately 3.4 acres that the county can: 1) allow township to purchase the property at market value which is allowed for public purpose; 2) township can apply for a free conveyance use permit for approximately $500 which half goes to Department of Revenue and other half to the County (need approval from near neighbors), 60 day review and after 30 years of land being used as proposed the land would be owned by township; and 3) apply for easement with cost being calculated by the foot. Swanstrom will mail letter of thanks to Commissioner Tom Rukavina for his assistance in seeking solutions for access to township land off Rossini. Mead reported on various follow up calls he made. Future Forests were contacted about the effectiveness of the spraying they did on township land. He was advised that the spray will remain on the plants until spring and further material will die. With discussion of coordinating two fire departments and the volume of yard brush involved it seems too complicated for township to piggyback on Northstar brush pile. If option to chip instead of burning brush pile was to be considered Mead sought estimates. Wastewood Recycling with chipping on site would be $2500 for set up plus haul away or to set up a semi in which brush would be loaded into would be approximately $300-400 dollars (semi would hold about 50 pickup loads), Bark Tree estimate was approximately $1500 to chip for one day and haul chips away. Another option to be considered is to charge residents a fee for disposal of yard waste. Mead received a call from Kevin Olson with a suggestion that his son Alex would like to consider a eagle scout project of a picnic shelter on the township land. Mead will invite him to a township meeting to present his proposal. Motion was made by Mead and seconded by Swanstron that a letter be mailed to John Wilson, per his request, outlining the use of and the restrictions on the township land, motion carried. Kuettel motioned to adjourn at 8:50 p.m., seconded by Mead, motion carried. Call to Order: meeting was called to order at 7:30 p.m. by Chair Donald Swanstrom. Clerk’s Report: Mead motioned to approve September Minutes, seconded by Kuettel, motion carried. Mead motioned to approve September Treasurer’s Report, seconded by Kuettel, motion carried. Swanstrom motioned to approve October Claims, seconded by Mead, motion carried. West Branch Road – Mead reported that the shoulder washed out during the storm. Thanks to Doug Nelson who donated his equipment (front loader) and time to get it fixed. Township land Planning Group report – Phyllis Mead of Pequaywan Lakes Association reported the following suggestions generated from the recent focus group meeting: (1) 30×40 open air pavilion; (2) driveway extension; (3) privy; (4) clearing open area where there are a lot of downed logs for possible informal recreation area; (5) electricity; and (6) well. She also mentioned the possibility of applying for a DNR grant which will be available when posted online starting December 2018. DNR requires a 50-50 match. Township’s share would be volunteer time @ $9 per hour. Expired 3-year Money Market Certificate – Mead motioned to apply for an 18-month Money Market Certificate for 2-$50,000.00 amount or a total of $100,000.00, seconded by Kuettel, motion carried. The certificate can be withdrawn at anytime without penalty for early withdrawal in case the town needs to access the funds. Use of township land for motorized vehicles- 4-wheelers and motorcycles are prohibited except for maintenance purposes. Signs had been posted to this effect. Mead will write a Resolution. Weed Inspection – Barnes reported that Deb Pomroy has been working on it but cannot submit a report until she gets the new information form that will not be available until December or later. Louis County Crack Sealing Maintenance Program – Kuettel reported that it will not work for us right now. The county charges $600.00 just for them to look at it. Public Comment: Residents expressed their concern about not having a burn pile. Discussion ensued that this is a big community issue especially for those that do not have an area to burn in their properties. Township land will be better utilized if there is a burn pile. Mead added that a location will have to be determined and may need easement from the county, create another driveway, and install culvert if location is on the east side of the land. Swanstrom motioned to adjourn at 8:30 p.m., seconded by Mead, motion carried.